Are Ebooks Dooming the Print Book? 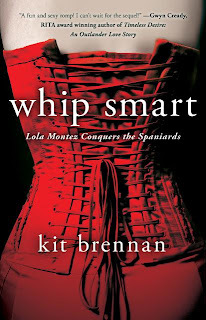 Astor + Blue Editions is proud to present, Whip Smart: Lola Montez Conquers the Spaniards, the rollicking first installment of a new series by debut author, Kit Brennan. It is 1842, London, and the gorgeous, ever-capricious twenty-two year old Eliza Gilbert, (a.k.a. Lola Montez) is in deep trouble and seeks escape from a divorce trial. Desperate to be free, Lola accepts an alluring offer of a paid trip to Spain, provided she fulfill a few clandestine tasks for Juan de Grimaldi—a Spanish theatre impresario who is also a government agent and spy for the exiled Spanish queen, Maria Cristina. Lola soon finds herself in Madrid, undercover as a performer in a musical play. But when she falls dangerously in love with the target, General Diego de Léon—the “perfect Spanish soldier, lover and horseman”—Lola becomes a double agent and the two hatch a plot of their own. Disaster strikes when the plot is exposed, Diego is captured, and Lola is forced to flee on horseback to France, with a dangerous group of Loyalists in hot pursuit. Will Lola’s reckless daring, feminine whiles, and signature whip be enough to save her life, her lover and her cause? She will have to be bolder and more whip smart than ever before. Written with zest and a passionate, fiery fervor by debut author Kit Brennan, Whip Smart irresistibly whisks readers into a vivid journey through 19th Century, France, England and Spain, riding sidesaddle with Eliza Gilbert, the hot-headed Irish girl, as she transforms into Dona Maria Dolores de Porris y Montez—a.k.a. Lola Montez, The Sensation of Europe! Kit Brennan is a nationally produced, award-winning playwright, and teaches writing and storytelling at Concordia University in Montreal, Quebec. The Victorian era and its personalities have always been of major interest to Brennan. Her play Tiger’s Heart explores the life of Dr. James Barry, who was actually a woman living a double life disguised as a man in order to practice medicine, which was not an option open to women at the time. Kit divides her time between the vibrant city of Montreal and the quiet lake wilderness of Ontario alongside her husband, Andrew, and a variety of animal friends. Whip Smart: Lola Montez Conquers the Spaniards is her debut novel. The above book is just one of the great ones you'll find from publisher Astor & Blue Editions. *NOTE: Astor +Blue Editions has put its entire first season’s list of e-book titles on a holiday promotional sale for $0.99 or $1.99. Here's the link to the catalog - http://astorandblue.com/catalog/. The sale will continue through January 7, 2013, for your convenience! All books may be found at Amazon, Barnes & Noble, Sony, Kobo and other locations. The Dame wishes to thank Mr. Viardo and Astor + Blue for this informative guest post.